About the Book Residents of a small Quebec village, half French and half English, are feuding as the Referendum on Seperation from Canada approaches. Meanwhile, an Arab entrepreneur is busy buying property (restaurant, hardware store, marina, large houses), and an Abenaki Indian with a law degree from McGill has arrived in town, allegedly for the spring fishing. 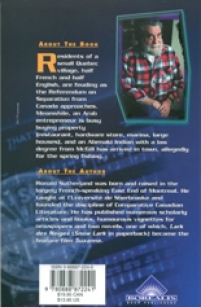 Ronald Sutherland (1933- ) has written a book of vignettes, "The Massawippi Monster and Other Friends of Mine" (2004 Borealis), and the novel "How Elvis Saved Quebec" (2003 Borealis). After completing his Ph.D., he taught at l'Université de Sherbrooke and founded the discipline of Comparative Canadian Literature. He has written scholarly essays and books, including "Second Image" and "New Hero." Other novels include "Lark des Neiges" and "Where Do the MacDonalds Bury their Dead."